Sparkling is important when you need to shine and be seen by the crowd. This mens purple glitter blazer has the show stopping attitude to get it done. Featuring a special glitter fabric that is purple all over and black glitter lapels with side vents this mens purple glitter blazer has loads of jaw dropping style. The jacket also comes with the matching bow tie for a complete look. 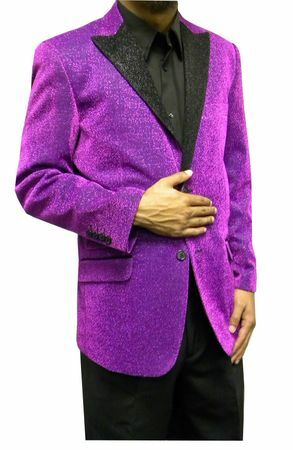 You'll look like the Stage Entertainer you want to be in this mens purple glitter blazer.